What is the F fund? The F Fund is designed to match the performance of the Barclays U.S. Aggregate Bond Index, a broad index representing the U.S. bond market. While the "F" in F fund stands for "fixed-income" but the funds annual return is anything but fixed. A bond fund's price changes based on yields earned and capital gains or losses as interest rates fluctuate. The table below gives you an approximate picture of the securities the fund is invested in. Since the average duration of the fund is about 5.4 years we can apply a little math to determine the fund's expected return. Over the next 5.4 years the fund's expected return will be real close to its current yield. This is because over that time horizon and change in yield will be offset by capital gains or losses. So a current yield of 2.6% implies an average annualized yield of 2.6% for the next five years. Now contrast the F fund's implied return with its past returns. The past is not a good measure for future returns. Why does the F fund show higher past returns? Since the inception of the TSP F fund interest rates have been declining. While the TSP F fund's yield remains close to the TSP G fund interest rate, the TSP F fund also captured capital gains due to declining interest rates. With historically low interest rates today, this effect could reverse if interest rates start rising. Otherwise in a steady interest rate environment the F fund yield and G fund interest rate should remain close. If you review our Lifecycle fund page you will see the Lifecycle income fund allocates 74% to the TSP G fund and only 7% to the F fund. The reason is simple, you get the same return today but the G fund has no risk of default or non-payments that come with the F fund. Since the inception of the TSP F fund interest rates have been declining. This allowed the F fund to capture the capital gains that come with bonds when interest rates drop. The TSP F fund's yield has always remained close to the TSP G fund's only source of income, its interest rate. With historically low interest rates today, this effect could reverse if interest rates start rising. Otherwise in a steady interest rate environment the F fund yield and G fund interest rate should remain close. If you review our Lifecycle fund page you will see the Lifecycle income fund allocates 74% to the TSP G fund and only 7% to the F fund. The reason is simple, you get the same return today but the G fund has no risk of default or non-payments that come with the F fund. 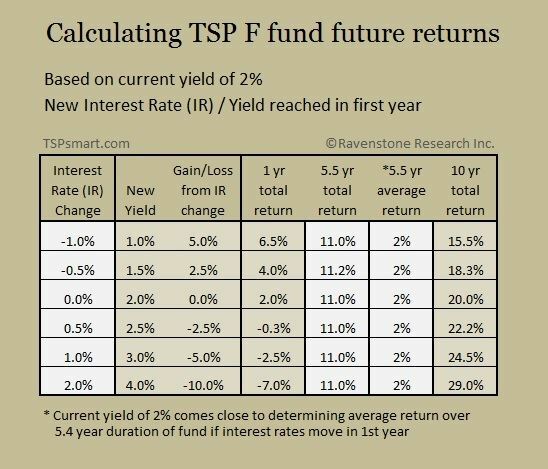 The annualized future return for the TSP F fund over the next 5 years is close to its current yield. Three examples: 1) If the yield remains unchanged, there are no capital gains or losses and you your only income is the current yield. 2) If interest rates rise, the higher yield you will receive will be offset by capital losses over those 5 years. 3) If interest rates decline you will receive capital gains, but the capital gains will be offset by a lower yield. 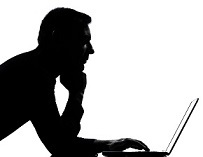 With an approximate 5 year effective duration of its underlying securities we can apply a simple rule to calculate the TSP F funds capital gains or losses. For each 1% movement in interest rates, the fund's price moves opposite by 5%. 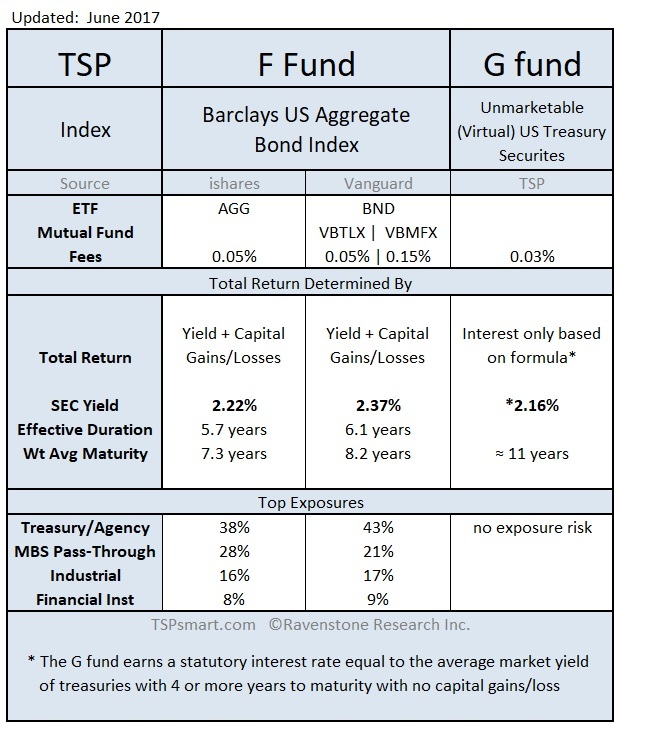 The only time the TSP F fund would outperform the TSP G fund is during the time interest rates are dropping. The historic low in 5-year treasuries interest rates was 1.2%. If the F fund yield drops this amount again, that would provide a 5% capital gain with very little yield going forward. In the chart below, we start with an approximate current yield of 2%. The first column represents a change in interest rates in the near term. The second column is the new yield and the third column is the capital gain or loss incurred as the result of the change in the current market's interest rate. Then we can calculate the future returns for each scenario for 5.5 years and 10 years. The 5.5 year annualized return is always the current yield in our example. Note: In this example our yield changes in the 1st year then holds steady. As seen in the fourth column, the F fund can only beat the G fund during the time interest rates are falling. For interest rates to drop significantly going forward would require a deflationary period due to a slowing global economy. This is not out of the question and we are currently seeing negative interest rates in Europe and Japan. But this is the opposite direction the Federal Reserve hopes to go. Another important point to understand is that if interest rates drop 1% the first year, not only does the F fund have a lower yield built in it also has a negative 5% capital loss waiting as it moves back to its original 2% yield. The best outcome for us would be for interest rates to normalize to a higher level soon so we can earn a descent yield in either the TSP F or G fund assuming inflation remains the same. You do not want to be invested in the TSP F fund while interest rates are rising whenever this occurs. The great benefit of the G fund is that we immediately get to enjoy the benefits of the higher rates without incurring the capital losses.